Today, our planet Earth reaches its most distant point from the sun for this year. 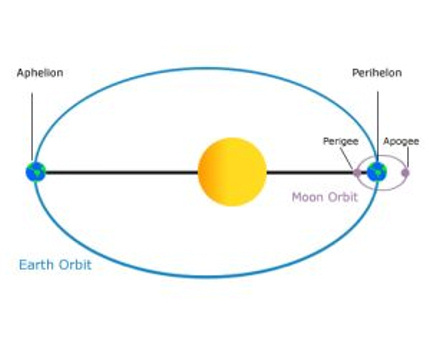 Astronomers call this farthest point aphelion, and, at aphelion, we are about three million miles farther from the sun than we will be six months from now. 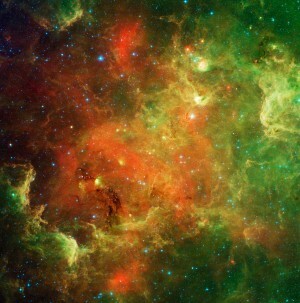 That is in contrast to our average distance from the sun of about 93 million miles. Are you looking for Earth’s exact distance from the sun today? It is at 94,508,351 miles. Last year, on July 3, 2009, the Earth at aphelion was a tiny bit closer, at 94,505,048 miles away. We’re always farthest from the sun in July during a northern hemisphere summer – and closest in January during a northern hemisphere winter – and that’s a good illustration of the fact that it’s not the Earth’s distance from the sun that creates the seasons on our world. Instead, the seasons result from Earth’s tilt on its axis. Right now, it is summer in the northern hemisphere because the northern part of Earth is tilted most toward the sun. Meanwhile, it is winter in the southern hemisphere because the southern part of Earth is tilted most away from the sun. Therefore, Earth’s varying distance from the sun does not create the seasons. However, it does affect the length of the seasons. That is because, at our farthest from the sun, like now, Earth is traveling most slowly in its orbit. That makes summer the longest season in the northern hemisphere and winter the longest season on the southern half of the globe. Conversely, winter is the shortest season in the northern hemisphere and summer is the shortest in the southern hemisphere – in each instance, by nearly 5 days.